Puisne Judge Aruna Aluthge being congratulated by President Ratu Epeli Nailatikau. 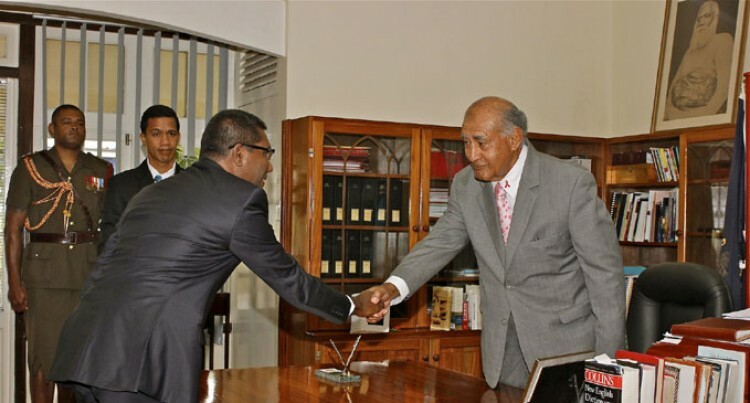 Two new members were sworn-in to the Fijian Judiciary by the President Ratu Epeli Nailatikau at Government House recently. Judge Buwaneka Aluwihare, who has more than 30 years of legal experience, joins as a Justice of Appeal of the Supreme Court. He completed his Masters of Law (LLM) from the University of London, Queen Mary College in 2004 and has been admitted to the bar as Solicitor in Wales and England as well as an Attorney at Law of the Supreme Court of Sri Lanka. Judge Aluwihare comes with international legal experience through the work he did for the United Nations as a prosecutor in the East Timor war crimes tribunal. He has handled many special assignments such as drafting laws, legal consultancy and as counsel assisting in Commission of Inquiry. Judge Aluwihare has served as visiting fellow at many legal institutes and presented papers on various topical legal issues at international meets. Also sworn in as Puisne Judge to the High Court was Judge Aruna Aluthge, who has 20 years of legal experience. He completed his Bachelor of Laws from the University of Colombo and double Masters of Law, from Washington College of Law of the American University in International Legal Studies and from Faculty of Law, University of Colombo. Judge Aluthge was previously employed as Attorney at Law, Supreme Court in Sri Lanka and has served as an international observer to monitor elections in Cambodia and Indonesia.